People dream, things come alive and sometimes books are written, sold, read and while everything should change and become something else, nothing happens except one thing: people dream, things come alive and sometimes books are written. How could someone have the courage to write a book? To give names to things which have no name or can not have names. To form what does not know form. To replace the reality with dreams about reality. Why? But, writing books happens. One more time I am wrong. It is reassuring. I try to practice Chanoyu - the Japanese Tea Ceremony. This is what I do. In rest, one day, one man, who seems to know what he is talking about, tells me: "I am curious by nature and now I am curious about tea. I want to share with people what I learned about this thing called Tea". So far good. But it does not last long. "Could you help me and write about Chanoyu - the Tea Ceremony? We write a book together." I turned slowly my head towards him so I could see his eyes. My mind was void of any possible response. Mind, reason and aesthetic pleasure are left behind, somewhere, to provide companionship for art connoisseurs, for artists, for craftsmen, for intellectuals, for poets, for Maecenas and Patrons of culture and social entertainment, for anyone, for Tea is for everyone. And everyone may have a say about Tea. Chanoyu is a complete Japanese thing. Know Chanoyu and you know the soul of the Japanese. During a visit at a museum in Vienna, I came across the following words: "Vulgarity is wanting something that you can't be or can't have. Vulgarity is born during the clash and cooperation present at the intersection of cultures. Vulgarity is when the unique becomes common, too available and is therefore a sign of abuse". My sensei always told me "do not ask, just practice". Sweet words to replace "do not be vulgar, do not have an opinion or a want before you are ready to have an opinion". As clear and simple as that. What happens when Chanoyu is practiced by non-Japanese? Who knows, so many ways, so many minds. 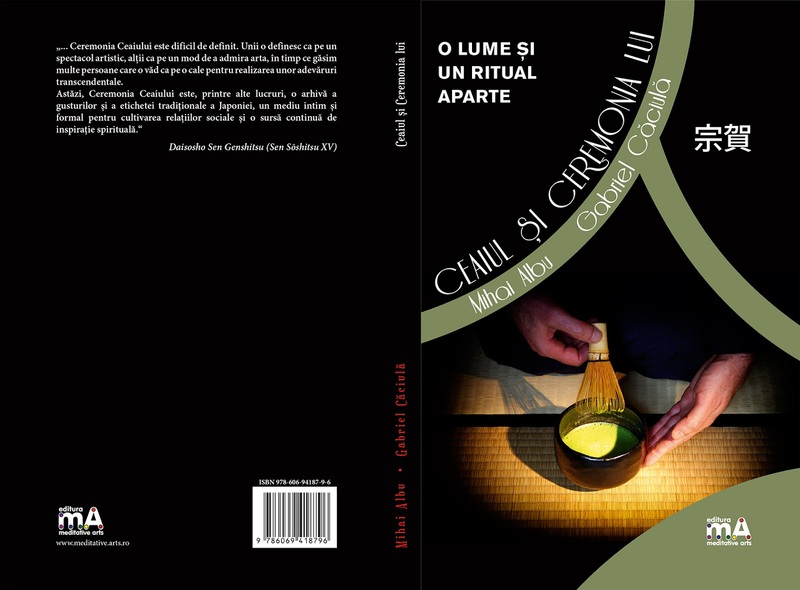 Here in Romania, we are committed to practice with respect for the tradition as transmitted by our Oiemoto in Kyoto and with full awareness that we may in every moment lose focus and slip into the shadows of vulgarity. That should not happen! I answered: "Yes, I am curious too. I will write this book with you". Knowing the impossible paradigm of writing a book, I want to share and I am curious to see how things have a life of their own, beyond my best possible guess or intuition. I want to talk about the impossible knowing that talking about the impossible is impossible. Things have a life of their own. A year later, thanks to Mihai Albu, the friend and co-author of this work, the graceful support of the Meditative Arts publishing house, and the support of a group of close friends, the book Ceaiul si Ceremonia lui (The Tea and its Ceremony) is printed out. The launching event will take place on Monday, May 22nd at 18:00 at the RENDEZ-VOUS teahouse in Bucharest, on Edgar Quinet street, close to the University Place.